Writing for the Hindustan Times, Manoj Sharma reports that New Delhi’s National Academy of Letters, the Sahitya Akademi, has opened its first bookstore outside its center at Mandi House. 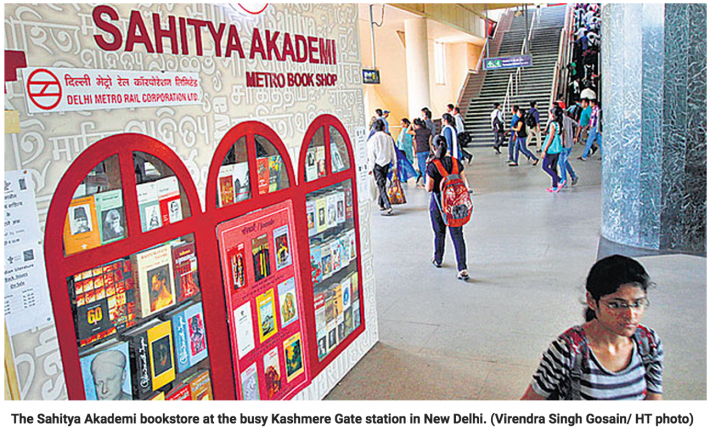 In February of this year, the bookstore, Sahitya Akademi Metro Bookshop, opened at the busy Kashmere Gate station in New Delhi. And last month, another bookstore was opened at Vishwa Vidyala station. Dr. Vishwanath Prasad Tiwari, president of Sahitya Akademi describes their reasoning for opening their own stores: “The idea behind the bookshops at Metro stations is to introduce literature in regional Indian languages to the common man. In fact we have also started a book club at our metro shops”. Akademi and the National Book Trust may really have hit the jackpot with opening in such a busy section of New Delhi. Rita Chowdhury, explains how placement is the key to such success, “There is a relationship between reading habits and accessibility of books. We may soon have book shops at MG Road, Gurgaon and Botanical Garden station in Noida. Munshi Premchand (known to Western audiences simply as Premchand, whose most famous book is the 1936 classic The Tale of the Cow) is among the bestselling authors at the Akademi’s bookshops, but the stores also attract fans of the best-selling “dramedy” author Chetan Bhagat, who writes about middle-class urban Indians. “I have a hard time explaining to [customers] that we do not keep Chetan Bhagat books,” Pawan Kumar Arya, manager of Akademi’s store at Kashmere Gate station told the paper.